With 50% of the votes counted, Yisrael Katz is in first place, followed by Yuli Edelstein and Gideon Sa'ar. 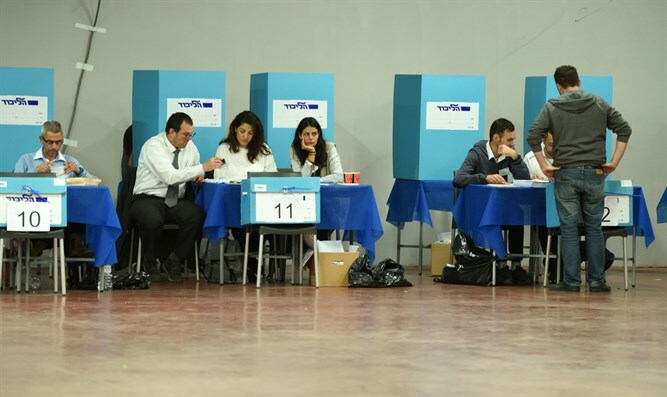 The polls in the primaries for the Likud list for the 21st Knesset were closed on Tuesday night at 10:00 p.m. at the conclusion of 12 hours of voting. The results of the primaries are continuing to arrive at the campaign room set up by the Likud administration in Kfar Maccabiah in Ramat Gan. As of 6:55 a.m., about 50% of the votes were counted. Minister Yisrael Katz is in first place, followed by Knesset Speaker Yuli Edelstein and Gideon Sa’ar. Minister Gilad Erdan came in fourth and Miri Regev is in the fifth place. Minister Yariv Levin comes in sixth, Minister Yoav Galant is in the seventh spot, former Jerusalem Mayor Nir Barkat is eighth, MK Avi Dichter is ninth, and Minister Gila Gamliel closes out the top ten. They are followed by Miki Zohar, Sharren Haskel, Ayoob Kara, Keti Sheetrit and Yehuda Glick. The list does not include district representatives which will be integrated into the national list and will cause some of the names above to move further down the list. The final and official results are expected to be published around 7:30 a.m. on Wednesday morning. In addition, there was a vote on Prime Minister Binyamin Netanyahu's request to allow him to reserve three spots for candidates of his choosing the 21st, 28th and 36th spot on the party's Knesset list. The primaries took place in the wake of the ongoing conflict between Prime Minister Netanyahu and former minister Gideon Sa'ar, who ran for office on the national list. At a joint press conference held by Prime Minister Netanyahu with the Austrian president, he was asked about the accusations he recently made about Sa'ar and made it clear that he stands behind them. "I do not take back even one syllable from what I said about Gideon Sa'ar," Netanyahu said in response to Sa'ar's claims that Netanyahu was making up stories about him. "I have one request of the Likud members - go vote, and also vote on my proposal to reserve spots, in case we need them," added the prime minister.